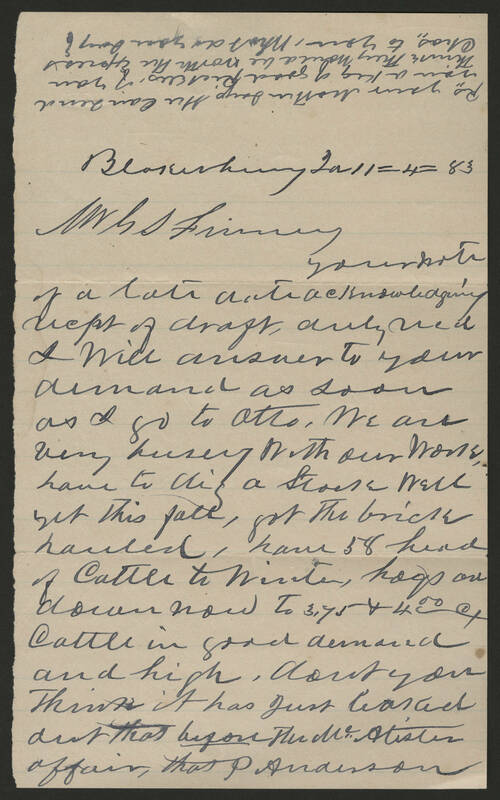 Blakesburg Ia 11=4=83 Mr G S Finney your note of a late date acknowledging recpt of draft, duly recd I will answer to your demand as soon as I go to Otto. We are very busey with our work, have to dig a stock well yet this fall, got the brick hauled, have 58 head of Cattle to winter, hogs are down now to 3.75 & 4.00c Cattle in good demand and high. dont you think it has just worked out that before the McAlister affair, that P Anderson [along top of letter] Ps. your Mother says she can send you a keg of good Pickles, if you think they would be worth the express [Chas?] to you, what do you say?